Students are actively encouraged to have a voice and share their views and opinions regularly. Our active school council is one such example. The school council representatives (2 per class from Year 7 to Year 11 and Year 13) meet regularly to discuss whole school issues and represent the views of their class. 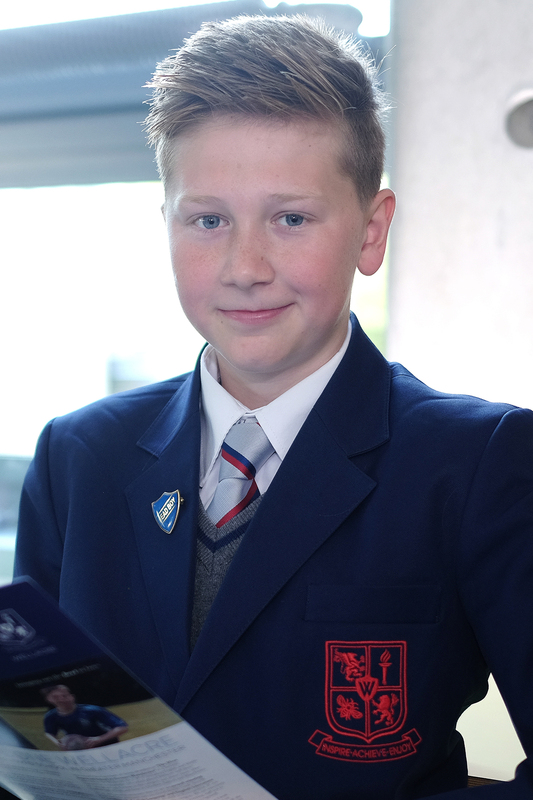 All students also complete an annual questionnaire which provides them with the opportunity to share their views of their time in school and suggest ways in which the school could be improved further. Governors are also invited to the Student Executive Council to establish their views as a way of ensuring that school self-evaluation is robust and accurate, and therefore effective in moving the school forward. The importance of laws, whether they be those that govern the class, the school, or the country, are consistently reinforced throughout the school day, as well as when dealing with misconduct and through school assemblies. Students are taught the value and reasons behind laws, that they govern and protect us, the responsibilities that this involves and the consequences when laws are broken. Our schools rules, which are displayed all around school, are referred to regularly and consistently upheld are a practical example of this. Visits from authorities such as the Police and Fire Services help reinforce this message. In RE lessons, the difference between religious law and the law of the country are discussed. Within school, students are actively encouraged to make decisions and choices, knowing that they are in a safe and supportive environment. As a school we educate and provide boundaries for students to take risks and make choices safely. Students are encouraged to know, understand and exercise their rights and personal freedoms and advised how to exercise these safely, for example through our E-Safety and RESPECT lessons. Whether it be through choice of learning challenge, how they record their learning, participation in one of our extra-curricular clubs and opportunities, children are given the freedom to make choices and decisions. Assemblies are regularly planned to address this issue either directly or through the inclusion of stories and celebrations from a variety of beliefs, countries, faiths and cultures beyond our students’ experiences. Our RESPECT teaching reinforces this. We will act to remind any students, staff or parents expressing opinions contrary to fundamental British Values, including those expressing extremist and radical views of tolerance to those of different faiths and beliefs. We rely on our strong values and ethos to steer our work and ensure the pastoral care of our students protects them from exposure to negative influences. Wellacre is fully committed to safeguarding and promoting the welfare of all its students. As a school we recognise that safeguarding against radicalisation is no different from safeguarding against any other vulnerability. 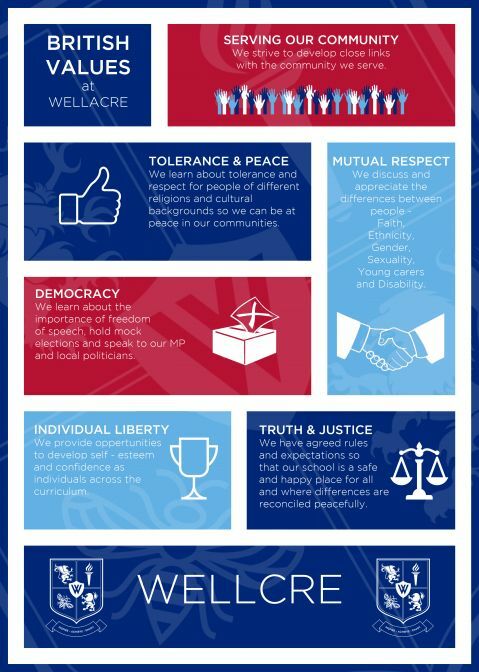 All staff are expected to uphold and promote the fundamental principles of British values, including democracy, the rule of law, individual liberty and mutual respect, and tolerance of those with different faiths and beliefs. • Students are encouraged to adopt out motto “Inspire, Achieve, Enjoy”. This complements the key “British Values” of tolerance, respect, understanding, compassion and harmonious living. • Students are taught how to keep themselves safe, in school and when using the internet. • Students participate in local community events so that they appreciate and value their neighbours and friends who may not share their background. • Student wellbeing, confidence and resilience are promoted through our thoughtfully planned RESPECT curriculum and extra-curricular learning opportunities. • Students are supported in making good choices from Transition to Year 13, so they understand the impact and consequences of their actions on others. Our curriculum promotes respect, tolerance and diversity. Students are encouraged to express themselves through discussions, debates and consultations. The RE (Religious Education) and RESPECT provision is embedded across the curriculum, and underpins the ethos of our school. Students learn about major faiths and visit places of worship where possible. They are also taught about how to stay safe when using the internet. Although serious incidents involving radicalisation have not occurred at Wellacre to date, it is important for us to be constantly vigilant and remain fully informed about the issues which affect the region in which we teach. Staff are reminded to suspend any professional disbelief that instances of radicalisation ‘could not happen here’ and to refer any concerns through the Child Protection/ Safeguarding Lead Teachers. Actively promoting the values means challenging opinions or behaviours in school that are contrary to fundamental British values. Attempts to promote systems that undermine fundamental British values would be completely at odds with schools’ duty to provide SMSC. The Teachers’ Standards expect teachers to uphold public trust in the profession and maintain high standards of ethics and behaviour, within and outside school.This includes not undermining fundamental British values. We agree that these are important values that our students should be taught, at school and at home. In addition, the importance of democracy and the rule of law will be promoted. These values for Life in Modern Britain fit perfectly within our code of conduct and our school curriculum e.g. in RESPECT lesson, via our assemblies, form time and our curriculum of Religious Education. We will also endeavour to make links to these values whenever possible, in our everyday interactions with the students. Our extra-curricular clubs and curriculum enhancement activities (School Council, charity events etc.) provide further opportunities for the students to learn about these values.